Pomegranates are best known for their ability to improve arterial health.Accumulating data have demonstrated that pomegranate has cancerprotective properties as well.1-3Some of the most promising findings on pomegranate extracts show their ability to impede progression of prostate cancer. Additional studies indicate that pomegranate may protect against breast and colon cancer as well.4,5Dietary factors are increasingly recognised as playing a role in cancer development. 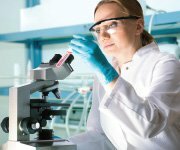 More than 70% of certain malignancies—like colorectal cancer—are related to diet and lifestyle factors.6Studies show that high fruit and vegetable consumption is associated with lower cancer incidence.6 That’s especially true when diets include large amounts of polyphenols from specific plant foods.7The challenge is that, while adding polyphenol-rich foods to our diets is beneficial, it doesn’t always provide enough polyphenols to exert a meaningful effect on prevention.6 That’s where pomegranate extracts may play a crucial role. The most promising studies on pomegranate’s anti-cancer actions are on its ability to slow the progression of prostate cancer.In prostate-cancer patients, serum PSA levels are the most commonly used marker to assess disease status. One standard for evaluating cancer progression is to measure the time it takes for PSA levels to double from a baseline value. 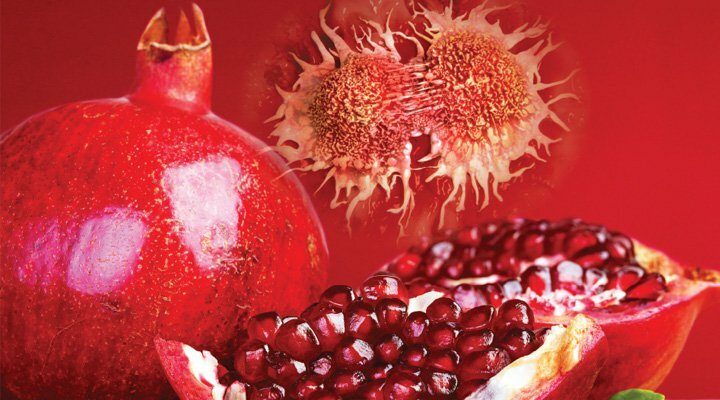 The longer it takes for PSA to double, the slower the cancer is progressing.8Studies show that supplementation with pomegranate juice or extracts can significantly increase the time it takes for PSA to double in men with prostate cancer. In one study, men received 8 ounces of pomegranate juice daily following surgery or radiotherapy for prostate cancer. Prior to treatment, the subjects’ PSA doubled in an average of 15 months, indicating quite rapid disease progression. 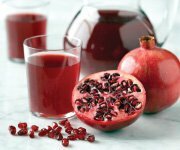 But after treatment with pomegranate juice, PSA took an average of 54 months to double its value, which is a clinically and statistically significant difference.9Another study evaluated men with recurrent prostate cancer (which is cancer that comes back after treatment such as surgery). In this study, taking pomegranate extract daily for up to 18 months increased the time it took for PSA to double from 11.9 months at baseline to 18.5 months.10These studies offer evidence of pomegranate’s ability to slow down the progression of prostate cancer. While most of the clinical studies on pomegranate’s anticancer benefits have been conducted in men with prostate cancer, the encouraging results can be expected to translate to other malignancies as well. In fact, numerous animal and basic lab studies have now added to our understanding of pomegranate’s promise in cancer prevention.One of the first questions about any natural compound (or drug, for that matter) is how well it is absorbed after oral intake. It is also important to determine how much of the compound ultimately reaches its target tissues (glands, organs, etc. ).Studies show that the pomegranate components ellagitannins (which are the most abundant polyphenol found in pomegranate juice) are not only extremely well-absorbed, but also get delivered to many of the tissues where human cancers arise—especially prostate, colon, and intestinal tissues.11 This important finding was confirmed in a human study of colorectal cancer patients. When the patients supplemented with 900 mg of pomegranate extracts for 15 days prior to surgery, it resulted in significant accumulation of the extracts and their active breakdown products in colon tissue, indicating a targeted effect.2Once they get to their target tissues, pomegranate compounds exert numerous effects that can help prevent tumors from developing and spreading. This has been demonstrated in animal studies of xenografts, which are implants of human cancer cells that are surgically engrafted into host animals. Xenograft studies now demonstrate that not only can pomegranate extracts delay the development of a tumor after it has been implanted, but they can also decrease the size and blood supply of those tumors that do develop.12-14Supplementation with three specific compounds found in pomegranate—luteolin, ellagic acid, and punicic acid—has also been shown to inhibit the progression and spread of prostate cancer in animals injected with human tumor cells.14 In this study, pomegranate supplementation inhibited the growth of the primary tumor, and also shut down biochemical signaling pathways required for metastasis. As a result, none of the implanted tumors metastasized. This is a tremendously important finding, especially considering the terrible prognosis in humans when metastasis occurs. Cancer remains the number 2 killer of Americans, particularly those of advanced age.Pomegranate extracts, long known for their contributions to heart health, are now emerging as potentially major players in the field of cancer chemoprevention.Lab studies reveal at least seven major targets by which pomegranate extracts work to fight malignant transformation of cells.Animal studies demonstrate that pomegranate supplementation leads to reductions in tumor incidence, size, and number.Human studies show that pomegranate extracts can slow the progression of prostate cancer. Pomegranate extracts have positive effects in breast and colon cancer as well.Given pomegranate’s multiple mechanisms of action against cancer, coupled with its known cardioprotective effects, supplementation with pomegranate extracts offers a well-rounded approach to preventing some of today’s deadliest diseases. Pomegranates contain a host of protective molecules that benefit not only the plant, but those who consume it. While these constituents are best-known for reducing the risk of heart disease, they are now also being explored for their ability to help prevent cancer.Because cancer is a multifactorial disease, any compound aimed at preventing it should have multitargeted effects. This is a virtue of the active constituents of pomegranate fruit, skin, and even leaves. Lab studies show that pomegranate extracts exert at least seven distinct beneficial effects that confer protection to cells against malignant changes, while making those that do mutate less likely to progress.Animal studies help corroborate that pomegranate supplementation can reduce the incidence of cancers, slow their growth, and reduce the size and number of cancers that develop. Human studies indicate that pomegranate extracts are capable of slowing the progression of prostate cancer. Additional research findings indicate pomegranate’s potential benefits in breast and colon cancer as well.Pomegranate’s multitargeted properties make it an ideal chemoprevention supplement, one that is widely available and potent in its effects. Given its cardioprotective effects, pomegranate extracts offer a well-rounded approach to protecting against some of today’s deadliest diseases.